DIRT track racing is becoming a more popular sport each year. The “Boys ‘ follow the circuit for the thrills and the money. Most drivers are their own engineers, experience is their teacher in getting the last hundred “revs” out of the product of the back lot workshop. The game is a challenge for nerve, skill and brains. The rewards are in the form of thrilling experiences, quickened intellect and the purses and prizes won. For those who graduate to the big time, there are fortunes to be won on the tracks and not infrequently permanent positions with motor companies. “Faint heart ne’er won fair lady,” nor light foot an automobile race. It is a case of “give her the gun,” get her out in front and keep her there. Automobile racing, which a few years ago seemed to be on the wane and fast becoming a sport for the rich, is coming into its own on the dirt tracks, scattered throughout the land. 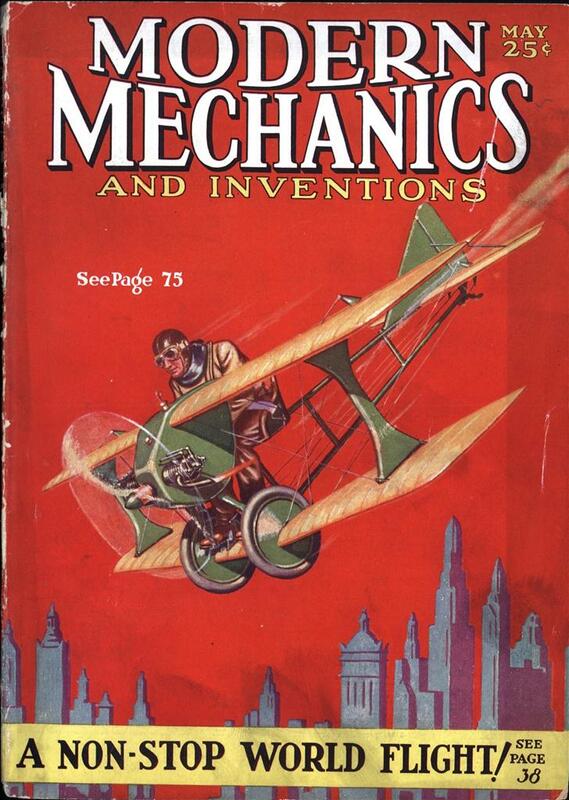 It is a game for the young man with a gift for mechanics, red blood in his veins and a whole “hod full” of sand. Of course, some money is needed, but not so much for the dirt tracks. Racing cars are built from the parts of some of the so-called cheap production cars. That is, those used on the dirt tracks are. 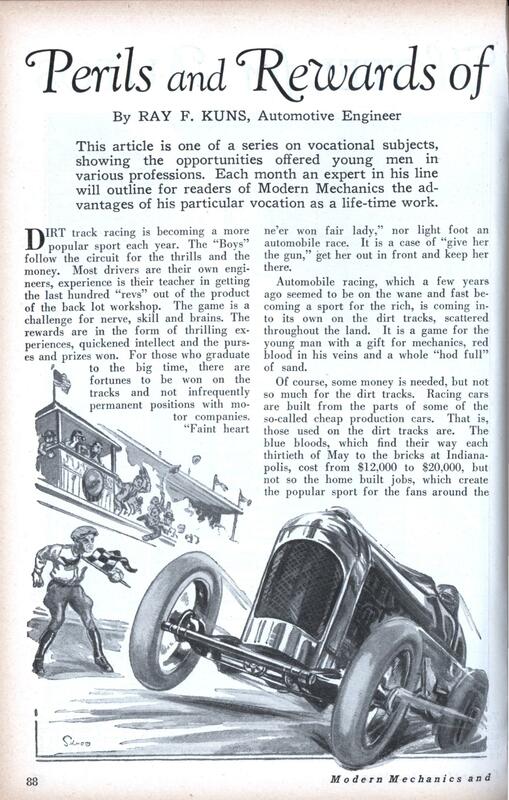 The blue bloods, which find their way each thirtieth of May to the bricks at Indianapolis, cost from $12,000 to $20,000, but not so the home built jobs, which create the popular sport for the fans around the mile and half-mile circles at state and county fair grounds. The cost is just about one-twentieth as much and if you can’t figure that out then you have no business trying to figure out rear axle gear ratios, compression ratios, “prematuring,” oil pressures, fuel systems, down-draft carburetors, piston clearances, bearing fit, balance and the many other things it is necessary to have just right to bring out the last “rev” in the old boat. The race at Altoona, Pa., on last Labor Day was won by an R. & R. Chevrolet Special, at the amazing speed of 95.9 miles per hour. When it is remembered that the speed at the big league Indianapolis track, last Memorial Day, was 99.5 or less than four miles faster, it is seen that these dirt track jobs are fast. In most cases engines with displacement up to 300 inches are admitted to the dirt tracks. The cars are generally Fords or Chevrolets rebuilt for racing, with special speed equipment. Some dirt track cars are old speedway cars, picked up and rebuilt by the youthful enthusiast. A dirt track racer is about 80% stand- ard or stock parts, the rest is special, but considerable work is done to make the stock parts acceptable. Here are a few things which must be done. Reduce the weight of the flywheel. Balance clutch, rods, flywheel, pistons, rings, crankshaft and other reciprocating parts, to the minutest limits. Drill the crankshaft (if not drilled) and provide 125 pounds oil pressure from a gear type pump. Increase the compression ratio from standard to as high as 9 to 1. Some drivers use as low as 6 to 1. Use special carburetors, manifolds and valves. Many times special rings are used. Pistons are provided with extra clearance. Bearings have greater clearance. The engine should “rev up” to 5,000. Rear axle ratios vary with the tracks, about 4 to 1 being popular. Wire wheels are required. Steering wheels should be bronze or steel. Ford Model T steering gears and spindles are barred from A. A. A. sanctioned events. The most desirable wheel base is 90 to 95 inches. Standard tread is used by some cars and a narrow tread by others. Not all races are run under the auspices of the A. A. A. If it is desired to be registered as an A. A. A. driver, it is necessary to appear with your mount at a sanctioned event and have a registered driver pace or follow the applicant. The speed must be within seven seconds of the track record for the half-mile courses and within twelve seconds for the mile course. The fee for registering with the A. A. A. is $3.00. Registered or not, there are some things a driver never does. The fraternity is one of gentlemen. The new entrant will quick- ly absorb the atmosphere once he starts following the circuit. It is reported that in most parts of the country there is no dearth of opportunity to race. In some cases as many as three races per week, during the racing season, are offered to cars and drivers with reputation for performance. Once you have a speed creation which will “burn up the track,” you will have plenty of bids to show your wares. Many of the drivers belong to dirt track circuits or teams and race on a regular schedule. The Big Time races have been won rather consistently within recent years by dirt track racers up for the first time. Dirt track training is good training even for the big time events. Rumor has it that this is to be the last year for the little 91 cubic inch engines on the big time tracks. If this is true, the dirt track boys will come into their own in a real sense.